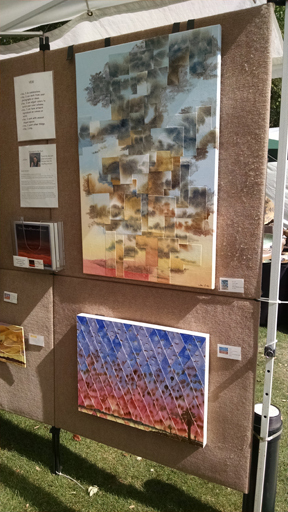 Back at the beginning of June I won 2nd place in category (Mixed Media) at the Thousand Oaks ArtWalk. But their ribbons were on back order so all I got was a piece of paper. Well, the ribbon finally came through. It reminded me of the song ‘Tie a yellow ribbon round the old oak tree’ from back in the (ahem) 70s. 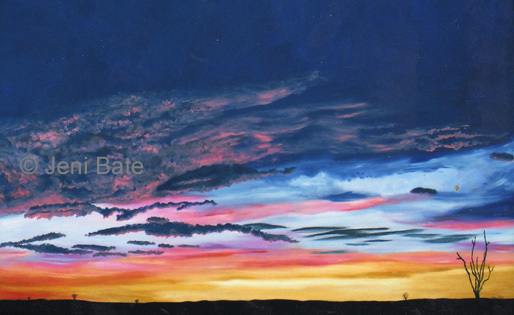 Now, if only that piece of paper had my name spelled correctly on it…..
Skyscapes for the Soul at Indian Wells. 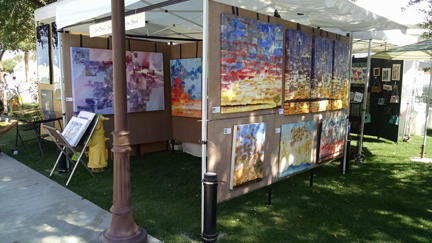 Last Saturday I got a call to say I had been taken off the waitlist for the three day Indian Wells Arts Festival – and here I am in a great space! Well, here the booth is – I’m behind the camera. 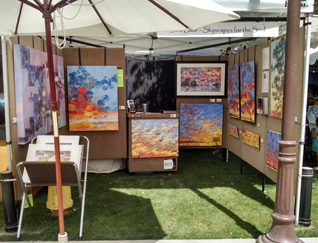 The interesting part is that my booth has an unusual fung shui water element – a fire hydrant in one corner. I later received a ‘virtual ribbon’ for not complaining about the hydrant. Like what are they going to do – move it??? I put the mat bin in front of it. Later in the afternoon, the oblique light across two of the paintings showed their texture to the best advantage. That is a great pink! 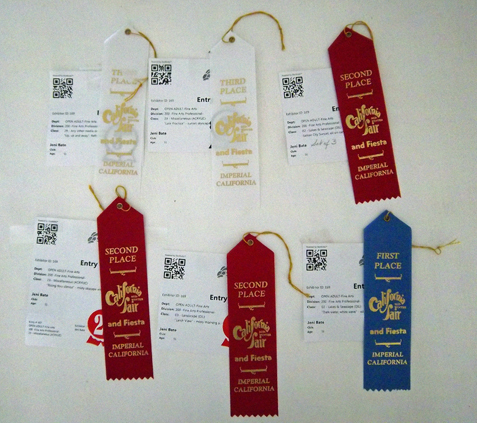 Although I don’t enter a lot of competitions, I’ve won a few ribbons over the years at galleries and at the county fair. 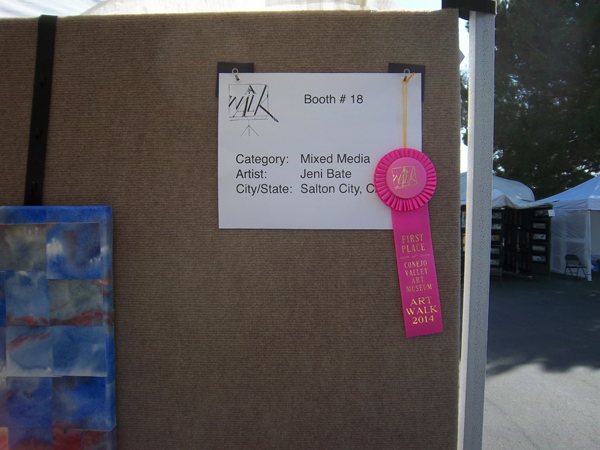 Last Saturday at Thousand Oaks was the first time I’ve won a ribbon at an art fair. And it was a good one. 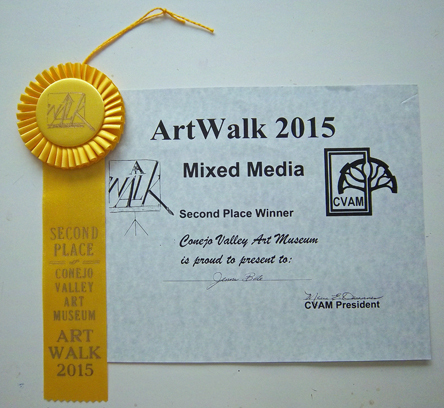 Best of category – Mixed Media for the refractured watercolors.